Yesterday I promised that today I would discuss the anglicization of clicks in borrowed words. Perhaps someone from southern Africa can answer this question better than I can, at least as far as South African English is involved. Thus the name of the Xhosa people and language is pronounced in English with a simple k in initial position, ˈkɔːsə or ˈkəʊsə. In the Xhosa language itself the initial consonant is ǁʰ (old ʖʰ), an aspirated alveolar lateral click. This name seems to be the only anglicized word with an original click that is reasonably familiar outside South Africa. Some historians will know about an event referred to as the Mfecane (also Difaqane, Lifaqane), the “scattering” of non-Zulus fleeing the Zulus in the early nineteenth century. In Zulu that’s mfɛˈ|aːnɛ (I don’t know what the tones are). I have heard it called əmfeˈkɑːneɪ, though I’m not sure whether that is the usual anglicization — the word is not even mentioned in Branford’s Dictionary of South African English (OUP 1980). To pronounce "ǃKung" one must make a click sound before the 'k' sound, often represented in texts as an exclamation mark. Strictly that should be a (post)alveolar click, old IPA ʗ, with affrication of the pulmonic-air velar component. But I think people (or non-phoneticians at any rate) usually give up and just say kʊŋ. What about voiced clicks? These are the ones spelt in Xhosa and Zulu as gc, gq, gx. They are articulated during the hold phase of a g. I can’t think of any words or names with a voiced click that are used in English. Then there are the nasal clicks, made simultaneously with a ŋ. These are the ones spelt in Xhosa/Zulu as nc, nq, nx or (breathy-voiced) ngc, ngq, ngx. The only relevant example I can think of is the Ndebele surname Ncube, which British newsreaders pronounce as ˈnuːbeɪ, ignoring the click. The OBGP calls this the ‘established anglicization’ of this name, and comments as follows. I have never heard anyone speak of the lawyer Bulelani Ngcuka, or of his politician wife Phumzile Mlambo-Ngcuka. Perhaps some South African reader has? (That’s Xhosa ˈŋǀʱuːkʼa, old notation ˈŋʇʱuːkʼa, tones not known.) He was a member of the law firm founded by Griffiths Mxenge (presumably mˈǁɛŋɛ, old notation mˈʖɛŋɛ), who was assassinated by the apartheid police in 1981. I haven’t heard that name pronounced in English either. So, summing up, the best tentative rule I can offer Jongseong is: to anglicize a click, ignore the velaric (click) component, and pronounce the rest, which is necessarily some kind of velar pulmonic consonant. Voiceless clicks become k, voiced ones ɡ, and nasal ones ŋ. But in initial position (which is where clicks are usually found), the last-mentioned obviously becomes n.
I haven't heard his name spoken for a while and my memory may be faulty, but for what it's worth I don't recall British newsreaders referring to Welshman ˈnuːbeɪ. I seem to remember they said n'kuːbeɪ. I wonder how long the advice has been to simply drop the click, rather than replacing it with a consonant as usual. I also wonder whether, with no disrespect to Prof Ncube, it makes sense to base linguistic advice on individuals' personal feelings, in terms of how they would prefer their names to be pronounced by English speakers. Suppose another famous Ncube felt differently, would we end up with two separate English pronunciations of the same name? But that's another story. Harry Campbell: Sure, why not? I use the MOUTH vowel in my name, but some Cowans probably continue to use the GOAT vowel, as my grandfather supposedly did, and there are Campbells with and without /b/. Personal names aren't like place names or ordinary words: everyone's an authority on the proper pronunciation of their own name. The name of the historical figure Cetshwayo used to be fairly familiar in Britain and still is in South Africa. 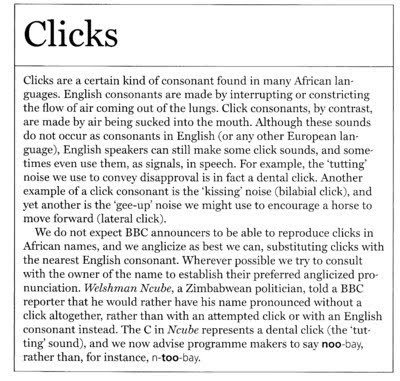 I've forgotten how my White South African friends and colleagues pronounced it — none of them could pronounce clicks, or even thought it possible for English speakers to do so. I think they said kɛtʃ'wajəʊ. Surprisingly, Wikipedia favours klétʃʷ'ajo. On a recent In Our Time, the South African historian Shula Marks inserts mfecane into an English sentence (about 10min45sec in). She uses a recognisable click, but her mf sound like a syllable when played back on my system. Toward the end of the programme (30 min 22sec), Melvyn Bragg steers the discussion to sɛtʃ'weɪəʊ. It's very much Melvyn's programme, and he prepares thoroughly, so he must have decided on this pronunciation as an anglicised spelling pronunciation. The next (presumably British) speaker, Saul david, almost says kɛtʃ'weɪəʊ but corrects himself to kɛtʃ'wajəʊ, a pronunciation that he repeats later. Another speaker, Saul Dubow (RP with perhaps traces of a former South African accent) later says (I think) kɛtʃ'wajə. (He pronounces Xhosa with a clck, but not a very convincing one.) When Shula Marks next speaks (39 min30sec), she says kɛtʃ'wajə — although she's previously produced a c click in mfecane. This suggests either a South African White standard, or else a desire not to show up her fellow academics. By the way, one of my SouthAfrican friends spent time in Britain and was startled to hear Xhosa pronounced 'zəʊzə. And the great defeat at Isandlwana was misunderstood, mispronounced and misspelled in Nottingham, where Isandula Terrace was built among streets celebrating imperial victories. You may find that the noise you make for Tut! Tut! is a good starting point. David Crosbie, Wikipedia currently has [kǀétʃʷʼajo], not [klétʃʷ'ajo]. Presumably, this is supposed to represent the Zulu pronunciation, not English. Again, the similarity of the symbols for the dental click [|] and the lateral [l] in sans serif fonts is causing confusion. The Economist had a special survey on South Africa last week. The reader of the audio edition gamely put a click in "Xhosa", though he was probably glad it only cropped up once in 16 pages. There were no other clicks for the other personal names etc. One theoretical difficulty with nativised approximations of foreign names is that differing approximations may sound closest for speakers of the source versus target languages. I don't know how much this happens in practice. I don't know what difference you typed in the two transcriptions, but on my system they appear as identical. presumably that's why my copy of the Wikipedia transcription appeared wrong. I can see the difference between the click and the lateral in your final sentence. How do you suggest that I alter my browser settings? I have a hard time distinguishing between the plain dental click and the labialized one, they both sound like "tsk-tsk" to me. David Crosbie, that's because in the latter instance I typed it as the bar character '|', which strictly speaking is incorrect, but is more distinct from 'l' in many fonts. Wikipedia uses the correct symbol 'ǀ', U+01C0 in Unicode. Not many fonts support this symbol to begin with, but in many that do the design may well be confused with the 'l'. Thanks for enlightening me. Now which of us is going to alter the Wikipedia entry? We have seen since in spades how catastrophic. JW has long been using | for ǀ, as Jongseong has done since the post of his I quoted above. What a farce that we should be reduced to this ad-hockery! What on EARTH possessed the Africanists working on Khoi-San languages to lobby for the Nama orthographic symbols when the IPA had perfectly good ones already in its best iconic tradition, and what on EARTH possessed Ladefoged et al to get the IPA to adopt them? I've just tried to edit the Wikipedia. Impossibe! There's a feature that links the transcription to an IPA reference page -- and will link to a Zulu Phonetics page when somebody gets down to writing it. Now the problem is that to encode the link you need to use the | character (Unicode 007C) in the 'encoding' part. So you can't use it as a letter-substitute in the 'coded' part. Wikipedia recommend various IPA compatible fonts. I downloaded their recommendation for Mac and tried to set it as my default Safari font. No Joy. Clearly Wikipedia imposes an unsuitable font for Read -- though the click character is clearly displayed in the Edit screen. No, it isn't the font. The Dental clicks page shows the Unicode 01C0 character correctly in isolation. It's the fact of being in a character string that makes it appear as a small L.
That's just on Wikipedia, though. On this site it always appears as small L —even in isolation. Gosh, David, I didn't realize you meant someone should attempt to change the Wikipedia [kǀétʃʷʼajo] to [k|étʃʷʼajo], with the ad-hoc vertical line instead of the click symbol. What a hilarious time you seem to have had attempting it! But I'm afraid in any case the piecemeal approach would just make confusion worse confounded. John, you of all people might be able to approach the fons et origo of this farrago and get something sensible done about it! It would have worked -- but for the formulaic value attached to the vertical line. The only unwanted side effect then would be to break the link with Wikipedia's IPA page. My commiserations! I have followed this up on today's blog, where I am delighted to see John has sent the beastly horrible vertical bar symbols packing.